The Griffins Youth Hockey Camp, held each summer at Griff’s IceHouse at Belknap Park, features current and former Griffins players teaming up to share their experiences, both on and off the ice. Celebrate winter in the city at Rosa Parks Circle! The Winterfest will begin at noon on Saturday, Jan. 19 and conclude with The Great Skate, which runs from 10 p.m. on Jan. 19 until 10 p.m. on Sunday, Jan. 20. Supporting Grand Rapids-area youth hockey programs and the Griffins Youth Foundation, Griffins players visit youth hockey practices to hand out t-shirts and help teach fundamentals of hockey. The "Put A Lid On It!" program promotes bike helmet safety to elementary and middle school children throughout West Michigan, with an ultimate goal of reducing the occurrence and severity of head injuries. The annual Griffins Youth Foundation Golf Classic at Egypt Valley Country Club is one of the largest fundraisers for the Griffins Youth Foundation. Catch the 14th annual Griffins / Sled Wings sled hockey game at our new venue, Griff's Georgetown in Hudsonville! At this wine and beer tasting benefit for Easterseals Michigan, Griffins players serve craft beer and wine samples to more than 150 guests, who also enjoy live music and hors-d’oeuvres. Griffins players and coaches will visit all six Uccello's locations in West Michigan to serve food and wait tables, with tips and proceeds benefiting the Griffins Youth Foundation. Thanks to Michigan Office Solutions, 24 journalism students and newspaper writers from schools throughout Michigan receive the opportunity to cover a pro sporting event and learn from members of the local media. The Griffins and Farm Bureau Insurance team up each season to provide a $15,000 media room makeover for one deserving elementary or middle school in Kent, Ottawa or Allegan Counties. 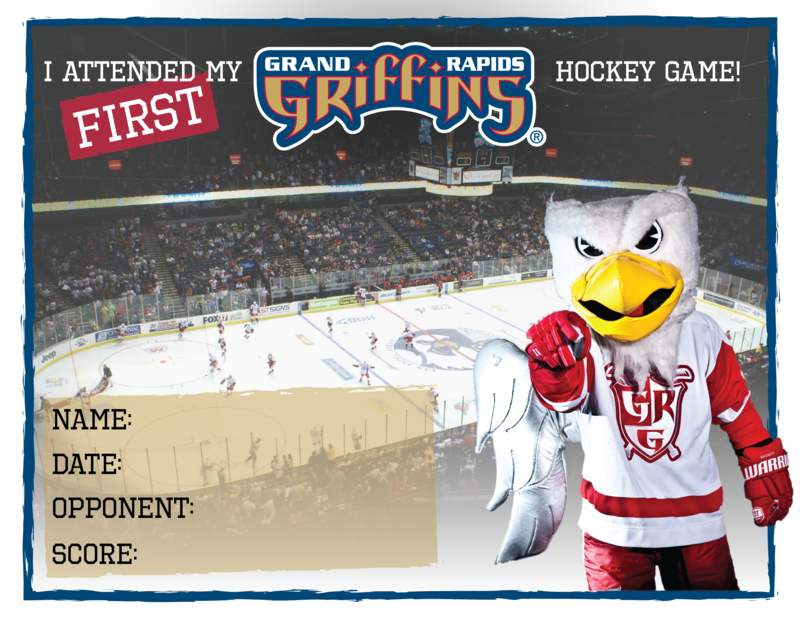 Twice each season, the Griffins reward young readers through the Griff’s Reading Goals program, in cooperation with Kent ISD and the Ottawa Area Intermediate School District. Griffins players aren't the only ones who make West Michigan a better place to live, as their wives and girlfriends team up to assist the organization in its community endeavors. Partnerships between the Griffins and more than 50 branches of the Grand Rapids Public Library, Kent District Library and Lakeland Library Cooperative reward kids who complete their local summer reading program. Several Griffins players and alumni purchase Griffins season tickets that are donated to local charities, to help provide the children and families they serve with an enjoyable night out. For the last 19 seasons, the Griffins have held a Teddy Bear Toss during one of their games around the holidays. All teddy bears and stuffed animals thrown onto the ice are donated to Hug-A-Bears of Kent County. Established in 1995 by Dan and Pamella DeVos, the Griffins Youth Foundation promotes academic excellence, community involvement and healthy lifestyles among the youth of West Michigan, enhancing their lives through hockey and ice-related sports. For more than two decades, we have eliminated the high financial logistical barriers that prevent children from playing hockey. Our 350 boys and girls – many of whom are underprivileged, at-risk, underserved or have other special needs – also receive life lessons that help them succeed far from the ice.